Taunton pitcher Kelsey White will lead the team’s quest to repeat as state champs. The Taunton softball team’s run to a Division 1 state title last season was made even more extraordinary by the player at the center – freshman pitcher Kelsey White. White was dominant for the Tigers in the postseason, boasting a 0.60 earned run average in tournament play. In 17 regular season games, she went 15-2 in the circle with 115 strikeouts while hitting .436 with 24 runs batted in. 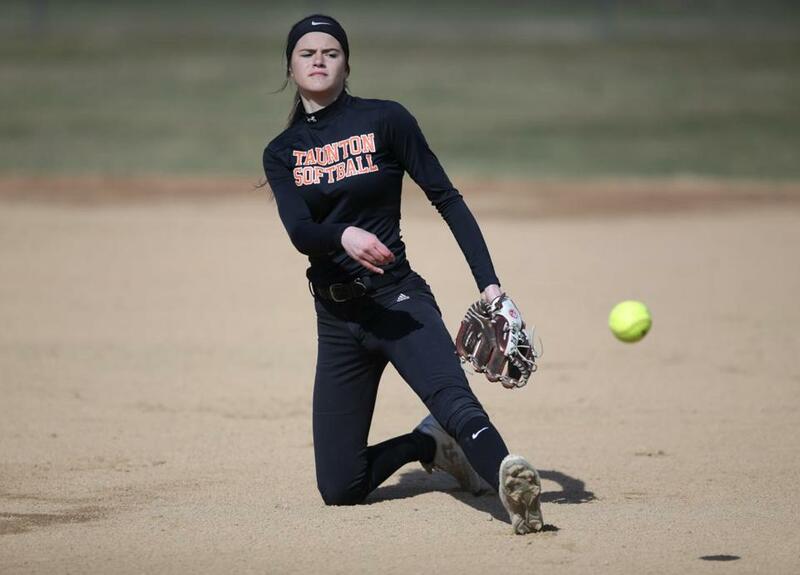 Entering her sophomore season, expectations are sky high for the Tigers sophomore, leading a Taunton corps that will rely mainly on pitching and defense following the graduation of its three top hitters — Kya Enos, Liana Duarte, MacKenzie Handrahan — who combined for 88 RBIs last year. Enos worked tirelessly with White to help her improve down the stretch while also providing a motivational, and at times calming, influence for the entire team. Stepping behind the plate this year will be junior Paige Silvia, who played first base last year, and classmate Riley Murphy, who took on a pinch-hitting role in 2018. Among the returning members from last year’s team is Kelsey’s older sister, senior Alexa White. The sisters headline the Taunton pitching rotation and benefit from a friendly one-on-one competition with each other. Command was White’s best quality last season as she kept opposing hitters off-balance with her five-pitch arsenal, now featuring a rise ball and drop ball. Spending time with her club team, Rhode Island Thunder 18U Showcase, in the offseason, White was able to refine her pitches and increase her velocity. She has continued to work daily on these pitches as well as developing her swing. Lewry expects Kelsey to be a big asset on offense as well, hitting near the top of the order. Division 2 contender Plymouth South got a similar contribution from a freshman last year. Amelia Freitas was among the best players in the state, sporting a 0.67 ERA with 212 strikeouts while batting .548 with 41 RBI for the Panthers. From the start, it was apparent Freitas would have a major impact. In her varsity debut against Scituate, Freitas tossed her first-ever perfect game and her confidence grew from there. But Plymouth South’s season came to a halt in the south sectional semifinals, with a heartbreaking 1-0 loss to Middleborough. That loss has served as motivation for Freitas and her teammates. Freitas, who pitches for the Mass Drifters 18U Showcase club team, features a battery of seven pitches and increased velocity, her fastball reaching 65 miles per hour. At the plate, she has found more consistency in her swing with a focus on making solid contact. “I’ve worked a lot on my mechanics to perfect myself as a pitcher,” Freitas said. In Division 3, Latin Academy won its 13th straight Boston City League championship last year with eight freshmen on the roster. One of those was pitcher Michaela Barcelou. After fellow freshman pitcher Carleigh Schievink suffered an injury in the Dragons’ season opener last year, Barcelou took over, going 10-6 with 2.94 ERA and 90 strikeouts. With a season under her belt, Barcelou is determined to help the team improve on last year’s 12-12 finish. Though the team clinched its 13th straight City League title last spring, Barcelou is eyeing a deeper state tournament run after falling in the first round of the D3 North bracket. After setting an MIAA record 1,331 strikeouts over five seasons, two-time Gatorade Player of Year Kelly Nelson has continued her dominance at Holy Cross. In her first season for the Crusaders, Nelson has held opponents to .116 average along with throwing a no-hitter and striking out 27 in a 16-inning win over Jacksonville. Her departure leaves a major void for Norton to fill this season. But Lancers’ coach Wade Lizotte feels his team can still be as strong as ever. “We want to prove that Norton is not a fluke,” Lizotte said. “The team all has a chip on our shoulders. It will be next man-up and we’ll win games in different ways but I believe we can be something special. The Lancers pitching situation will feature juniors Sofia Knopf and Julia Alves and senior Megan Vegnani. Friday, No. 16 Walpole at No. 3 Newton North (3:45 p.m.) – The Raiders open the season on the road against their Bay State Conference foe, the defending D1 North Tigers. Friday, Fairhaven at No. 4 Greater New Bedford (3:45 p.m.) – The Blue Devils swept their South Coast Conference series against the fourth-ranked Bears last spring, but fell to the eventual D2 South champions in the quarterfinals last season. Friday, Dighton-Rehoboth at No. 1 Taunton (3:45 p.m.) – D-R fell 1-0 in a nine-inning D2 South quarterfinal last year. Will their quest for redemption start against defending D1 state champion Taunton? Monday, No. 5 Austin Prep at Pope John XXIII (at Edith Street Park, 3:30 p.m.) – Last year’s D3 North champions will start their season off in Everett as they look to fill the void of D3 Player of the Year Logan McDonald. Monday, No. 7 Acton-Boxborough at Nashoba (4 p.m.) – Returning Globe All-Scholastic Lauren Meinhold will look to continue her success from last year (16-2, 117 IP, 109 SO, 1.39 ERA) as the Colonials open up their season. Globe correspondent Jenna Ciccotelli also contributed to this report.